Export your pics to Web album services. Is there a better alternative to QuickAlbum? Is QuickAlbum really the best app in Image Editing category? 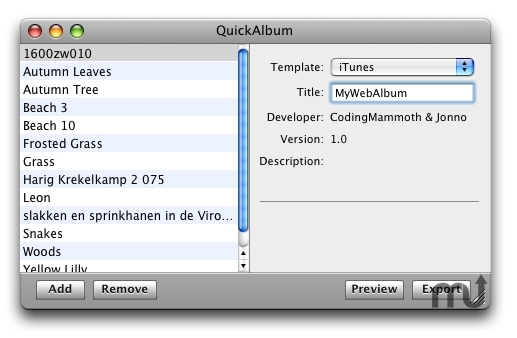 Will QuickAlbum work good on macOS 10.13.4? QuickAlbum is for users who want to share your pictures with your friends, but have no idea how; look no further! Just import your pictures in QuickAlbum, choose a web-album and export it! It's simple and fast. Try it now! Small fixes and improvements and is now available in the Mac App Store. QuickAlbum needs a rating. Be the first to rate this app and get the discussion started!